This week, The Democracy Collaborative is releasing a new paper that seeks to create a framework for measuring the effectiveness of university and hospital efforts to partner with and improve conditions in surrounding communities. 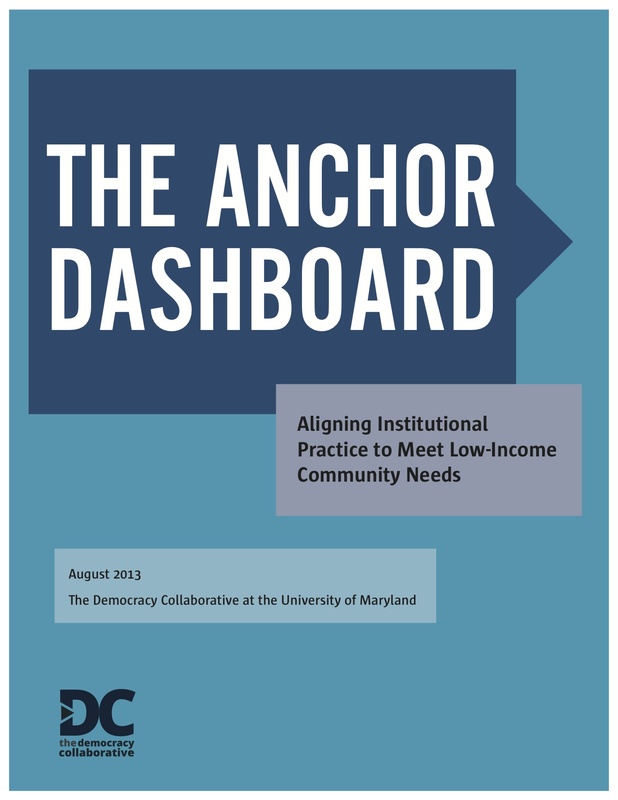 Titled The Anchor Dashboard: Aligning Institutional Practice to Meet Low-Income Community Needs, the paper is supported by a companion research report “Achieving the Anchor Promise: Improving Outcomes for Low-Income Families,” and a set of policy briefs. 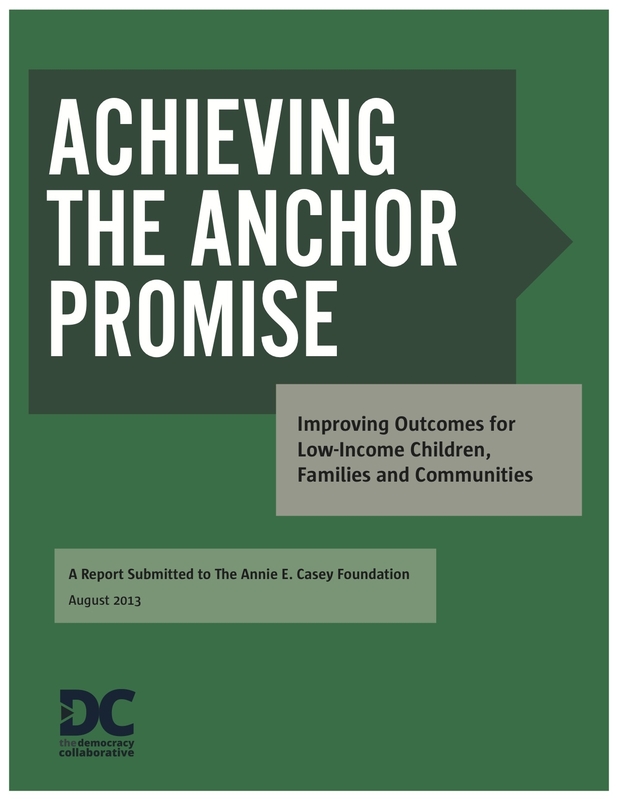 A central goal of this work, funded by the Annie E. Casey Foundation, is to focus attention on how anchor institutions can more effectively deliver benefits to low-income children, families, and communities—and, also, critically, on how to measure those benefits in at least a moderately effective way to assess progress and make adjustments as needed. Our research centered on surveying the state of the field through in-depth interviews with more than 75 individuals from a wide range of positions, including from hospitals, universities, partnership centers, national intermediaries and advocacy groups, federal agencies, foundations, and locally based community groups. For the community interviews, we partnered with the Sustainable Communities Development Group, led by Deeohn Ferris, to conduct 15 interviews of environmental justice and community development groups. From those interviews and from our past research on best practices in universities and hospitals, we have developed a dashboard with 12 key outcome areas and indicators to focus evaluation. The focus areas are: 1) local and minority hiring; 2) local and minority business procurement; 3) housing affordability; 4) business incubation; 5) arts and cultural development; 6) community investment; 7) public health; 8) public safety; 9) environmental health; 10) pre-K-12 education improvement; 11) community capacity building and democratic leadership development; and 12) asset building and ownership. Within each outcome areas, we provide some illustrative indicators that center on two different kinds of measurements: 1) measures that assess conditions in the community—e.g., whether or not housing is affordable, whether or not people are healthy, whether or not children get educated; 2) measures that assess institutional effort—e.g., dollars spent, procurement shifted, people hired, policies and accountability procedures in place. As foundations increasingly partner with anchor institutions to achieve their community wealth building goals, the issue of measurement only grows in signifigance. Examples of such foundation programs include the work of Kresge in its Woodward Creative Corridor initiative in Detroit and, more broadly, Living Cities in its five-city (Detroit, Baltimore, Cleveland, Newark, and Minneapolis-St. Paul) integration initiative. Of course, a dashboard, as the name suggests, merely provides a “first cut” at assessment. At The Democracy Collaborative, we see this paper as just one step, albeit an important one, in building a community of practice among community group and anchor institution practitioners. Some related fields, such as the Promise Neighborhoods Institute at PolicyLink, provide examples of how this could potentially work to build the field over time. The Anchor Institution Task Force will meet in Baltimore on Dec. 10 (registration is free) and provides one valuable venue for building in this direction. More broadly, the goal of presenting a set of common measures is to inspire discussions about selecting and improving indicators, demonstrate that assessing anchor impact is indeed possible, and encourage more anchor institutions to adopt an anchor mission. To make this report more accessible, next month we will participate in a public forum, sponsored by the HUD Office of University and Partnerships and HUD Office of Policy Development and Research. The event will take place on Wednesday, Oct. 2 from 1-3 p.m. (eastern) and will be live-streamed on the Web. We hope you can join us!